99 foiled, failed and completed attacks carried out labeled as ethno-nationalist and seperatist terrorism. In 2016 Dissident Republicans were involved in 76 failed, foiled and completed attacks, of which four were carried out using improvised explosive devices, including one in March in which a prison officer was killed. The police, prison officers and members of the armed forces in North Ireland remain the primary targets. There are three main violent Dissident Republican groups in Northern Ireland: the Continuity IRA (CIRA), the new IRA and Óglaigh na hÉireann (ONH). All mentioned groups retain access to a range of firearms and explosive devices, including under- vehicle IEDs. 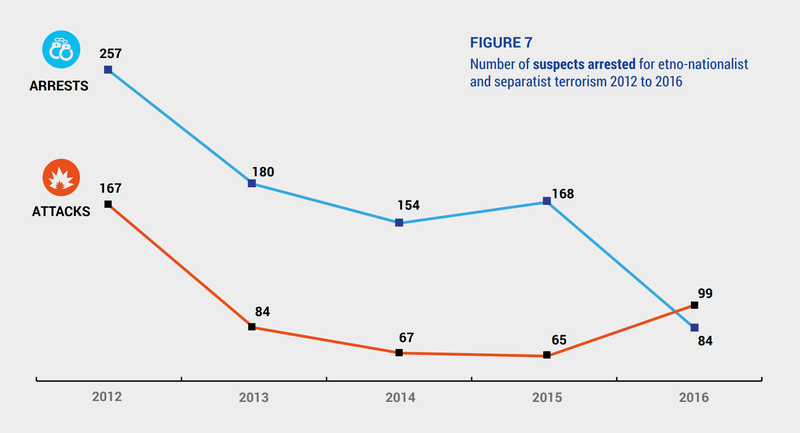 A total of 123 people were arrested in 2016 for terrorism-related offences. In May 2016, the threat level in the UK for terrorism related to Northern Ireland was raised from ‘moderate’ to ‘substantial’, which means an attack is a strong possibility. A number of incidents targeting Turkish institutions, cultural premises and properties occurred in several EU Member States. Five IED attacks against Turkish government buildings and cultural associations were reported by France. Belgium also reported incidents between Turkish and Kurdish groups involving the use of arson and explosives. Germany reported various incidents. A significant number occurred in the context of demonstrations for or against the PKK. Turkish properties and institutions were damaged by incendiary devices. In one arson incident, the damage amounted to at least EUR 2 million. In August in Nuremberg, three participants were injured during a fight, in which at least one was stabbed. Belgium, France, Germany*, Italy, Romania and Switzerland reported that the PKK continued its fundraising, propaganda and recruitment activities. In France it operated a legal front, which includes the Conseil Kurde de France (CDK-F) and the Centre d’information du Kurdistan (CIK); and a clandestine branch aimed at collecting funds, using violence in some cases. In France alone, the fundraising campaign is believed to have yielded EUR 5.3 million. Italy reported recruitment among Kurdish migrants to join Kurdish militia in conflict zones or to become PKK activists in Europe. In addition, Switzerland stated that the PKK were maybe running a number of ideological training camps for its youth in remote pre-Alpine areas during the second half of 2016. Since ETA announced its ceasefire in October 2011, it released a series of communiqués to confirm its separatist objectives, aligned with the strategy of the Basque separatist left-wing Izquierda Abertzale movement; its activities were focused on propaganda and controlling the sealing of its arsenals. 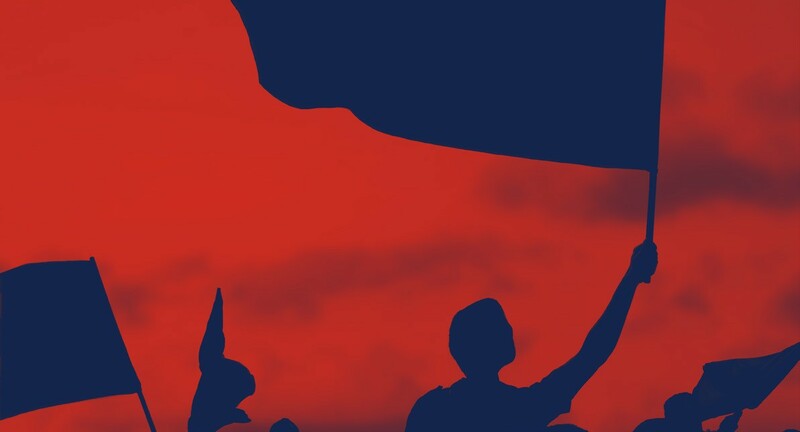 Five separatist terrorist actions of sabotage were reported in 2016 by Spain, compared to 18 in 2015; these actions are attributed not only to Izquierda Abertzale, namely the youth group Ernai, but also to dissident groups within this movement. 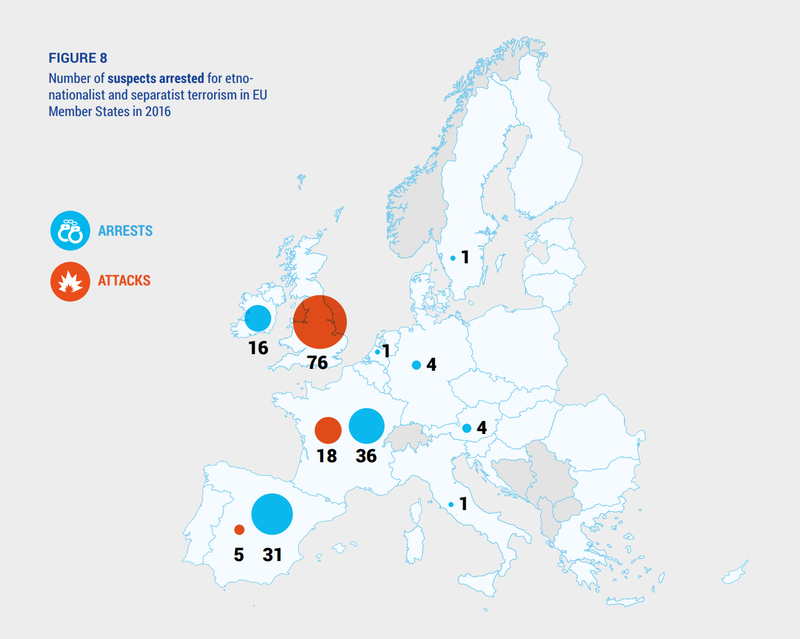 In 2016, a senior ETA leader was arrested and a significant amount of weapons and explosives were seized in Spain. France and neighbouring countries continue to be used by ETA for hiding operatives and weaponry. Switzerland reported that, in July 2016, 13 defendants associated with the Liberation Tigers of Tamil Eelam (LTTE) were indicted on charges of supporting and/or being members of a criminal organisation, fraud, false certification and money laundering. The suspects are accused of having provided financial support to the LTTE through a sophisticated credit system. Members of the community were persuaded to enter into credit contracts and pass on the funds to the LTTE’s Swiss branch and front organisations. This systematic and rapid scheme allowed them to obtain money from the Tamil diaspora in Switzerland. Investigations showed that substantial sums (around CHF 15 million) were obtained using this system as well as through donations and extortion. These funds, together with money collected abroad through similar schemes and transported to Switzerland by couriers, were to be later funnelled abroad to fund the purchase of weapons in Sri Lanka.